Once again, I am reminded to check every source. You may think you have all of your bases covered – but sometimes checking on one more source can fill in the details that you need. 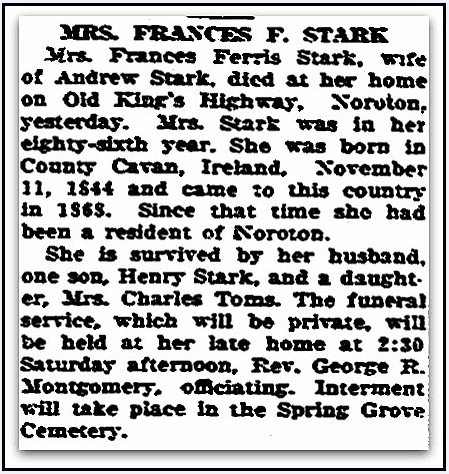 Take for example Frances (Ferris) Stark (1844-1930). Every time I looked at her name in the family tree, I assumed she was part of the large Ferris family that have lived for decades in Fairfield County, Connecticut. But, look closely at her obituary. It clearly states that she was born “in County Cavan, Ireland, November 11, 1844.” Details I didn’t have before. Based on this obituary I was able to add the complete date and the always important place of birth in Ireland. Genealogy Tip: When other sources simply say that a person was born in “Ireland,” it is often newspapers that tell you WHERE in Ireland they were born.